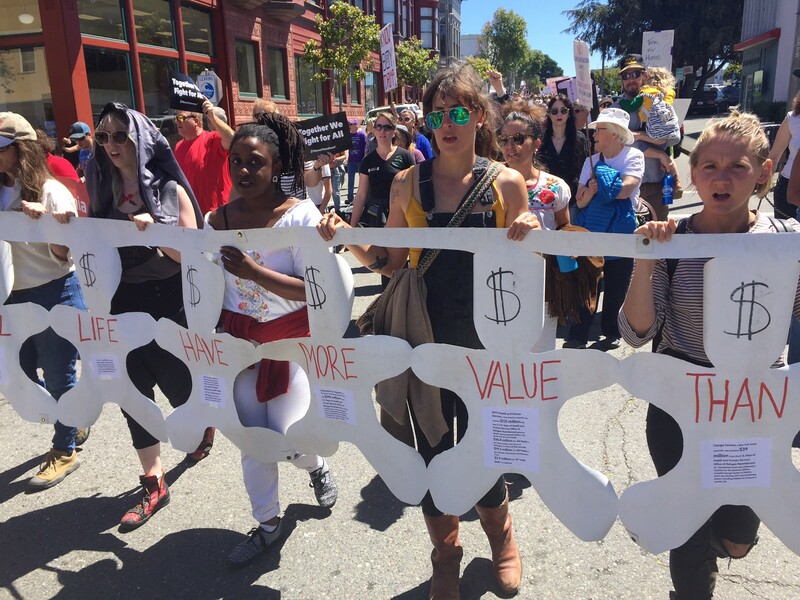 Protesters march down Third Street as part of today's Families Belong Together rally in Old Town Eureka. 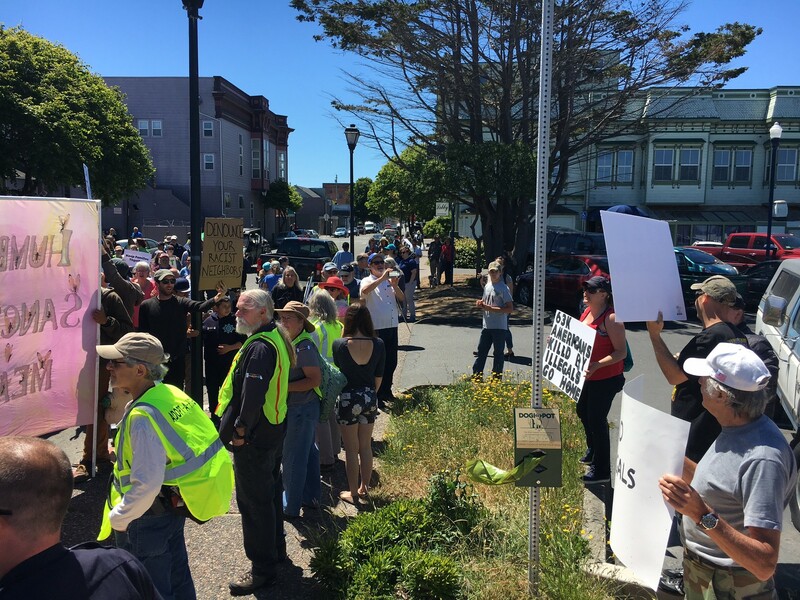 A diverse crowd of protesters stretching some three city blocks made their way through the streets of Old Town Eureka this morning, peacefully decrying the Trump administration’s “zero tolerance” policy at the border and demanding the reunification of separated families. 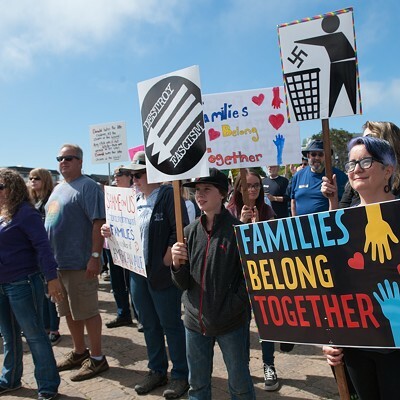 Similar Families Belong Together protests took place across the country today, with more than 700 planned from coast to coast. 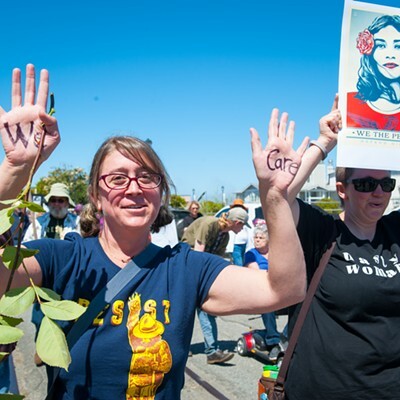 Local organizers put early estimates of the turnout in Eureka near 3,000. 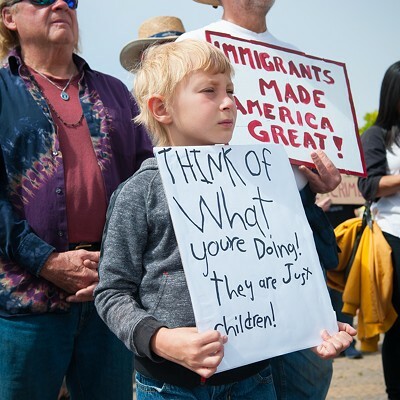 Among those was Linda Anderson, wearing a khaki jacket with the words “I Really Do Care” written on the back, an obvious reference to Melania Trump’s controversial choice to wear one sporting “I REALLY DON’T CARE, DO U?” on a visit to children being held at a Texas detention center. 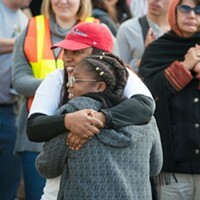 Anderson was walking along with her colleague Betty Macchi. 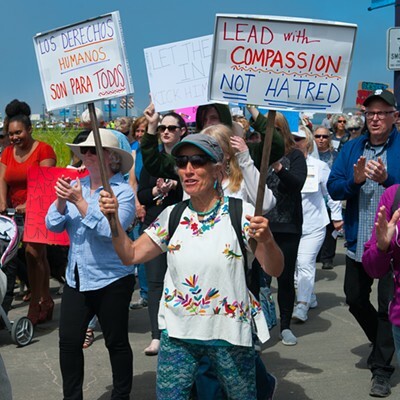 The women said, as early childhood educators, they were brought out to the march by their compassion for the children who were suffering untold trauma by being separated from their parents. “This is damage that is not easily undone,” Anderson said. A trio of counter protesters with signs reading "No Illegals," and "Stop Separations. 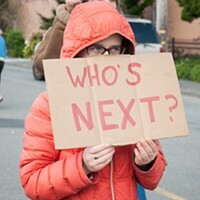 Go Home," had a brief, but terse exchange with a few of the marchers at end of the route as police and rally volunteers wearing lime green vests stood in between them. A brief exchange between marchers and counter protesters. 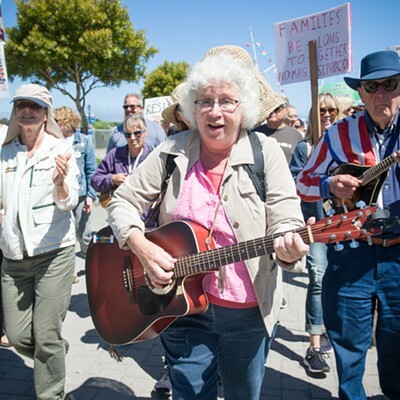 The gathering began in the Madaket Plaza on the foot of C Street with a Native American prayer before several speakers took to the podium, urging action and calling on local government officials to make Humboldt County a sanctuary county. 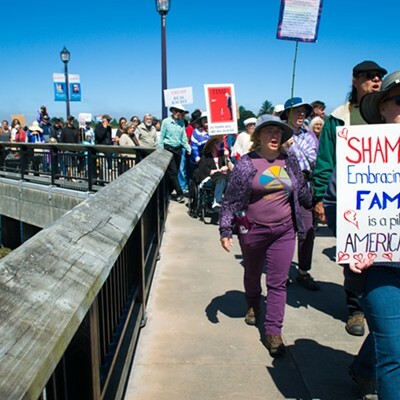 Renee Saucedo of Centro Del Pueblo Humboldt County reminded the crowd that the United States has a long, dark history of stripping children from their families, and asked why those lessons of the past have still not been learned. 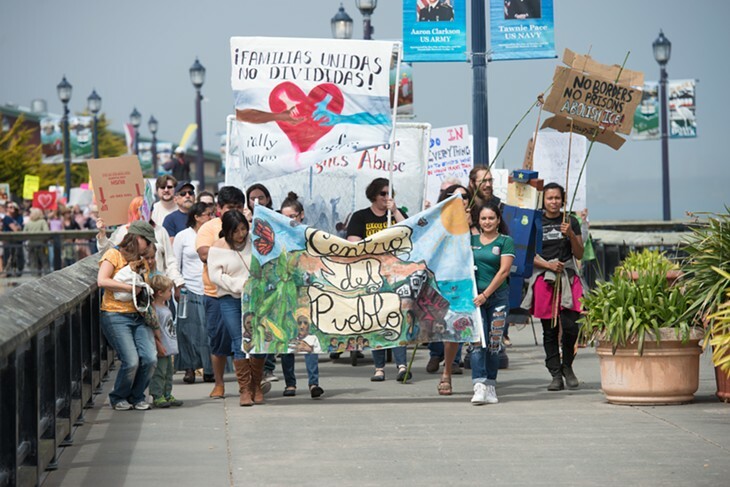 Paola Gonzalez, who left her native Colombia with her mother and brother when she was 8 years old, described the fear and hardship of making her way through the immigration process after the family first stopped in Puerto Rico. Describing herself as a mother, an immigrant and a warrior, Gonzalez said she remembers the immense fear she felt during the immigration interviews — the fear of deportation, the fear of being separated from her mother, the pressure to smile just right. In seeing the women now being separated from their children at the border, Gonzalez says she sees her mother, her aunts and herself. 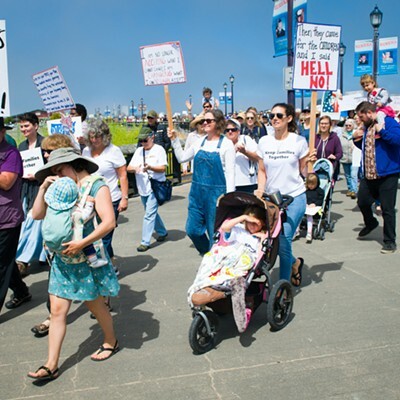 Editor’s Note: Read more about the Families Belong Together march is this week’s upcoming edition of the North Coast Journal.